Rena makes music and writes poetry. Her tattoo serves a purpose many of us can relate to: it contains wisdom that we want to hold on to and draw strength from. When did you start taking an interest in tattoos and what was it about them that you found appealing? I started trawling tattoo forums and saving images around the age of 13. I'd constantly draw/write on my limbs with ballpoint pen. It was strange - I can't draw at all and even then I didn't draw much on paper, but I'd turn up to class with my left hand covered in stars. I remember being fascinated by the fact that my skin could be made into a canvas. If you drew or tattooed a design on the body, it would stretch/shrink according to your body's movement. The piece would age as you aged, so you needed to go to a skilled artist, and then to preserve it with sunscreen. That was so novel to me. I was also a very angsty teenager who perpetually felt misunderstood. Covering myself in a visible marker was probably a weird mixture of a cry for help and a defiant declaration. In a ‘look at me, I'm a misfit’ way. Really glad I didn't (illegally) get a tattoo back then! Where does the quote in your tattoo come from and what significance does it have for you? I first saw the quote as a Jenny Holzer piece. She projected this phrase on the Niagara Falls. After Googling, I found it's a recurring line in an Adam Zagajewski poem of the same name. Both pieces left an impression on me. One of the reasons it took me till 22 to get a tattoo was because I didn't want a depressing tattoo. I've struggled with depression half my life and so I was always drawn to sad texts/art, but the rational part of me knew I shouldn't mark that sadness permanently on my body. At the same time, I didn't want to get anything happy-go-lucky - that's just not me at all, even when I'm doing well! Whenever I had a good idea for my tattoo, I'd always give myself three years to consider it, but would always decide against it around the two and a half year mark. When I saw this phrase, immediately I felt sure of it. I got it done three weeks later. Lucidity can be interpreted in many ways, but that moment of clarity, the place of clarity you reach after years of not even knowing you were lost, recognising and welcoming that lucid understanding is so important to me, and that was the biggest thing in my life at the time. That was an important mark of my growth. Not knowing that I was confused, scared, running away, then finally having that understanding and being able to say "OK, I understand it now, I'm not running away anymore." It's no wonder that the quote resonated with me so strongly then. When you look at your tattoo now, how does it make you feel? It's still an important reminder and two years on I still feel happy that I got it done. 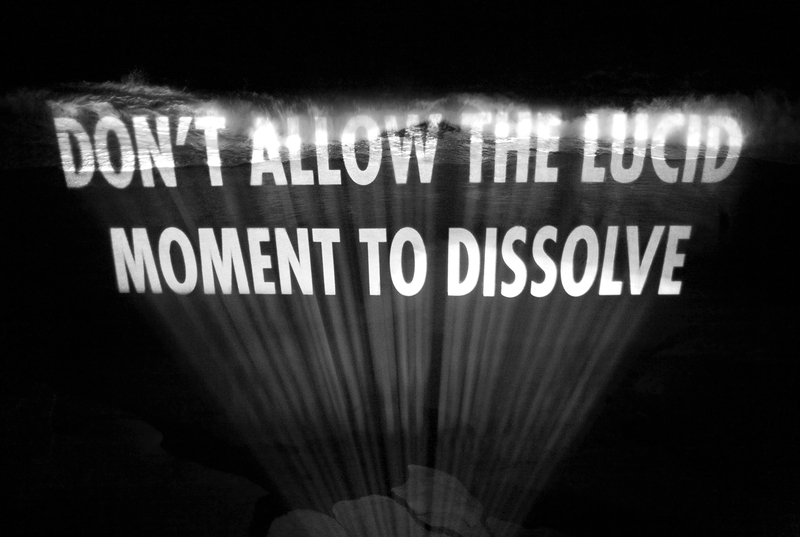 I don't notice it that often because I'm so used to it, but these days I've been reminding myself: "don't allow the lucid moment to dissolve." I'm quite excited to figure out the different ways I'll arrive at and preserve that lucid moment throughout life. How did you select your tattoo artist? Did you have a lot of input into the design? I obsessively look through artists' portfolios. I wanted someone who did good blackwork. I really liked what I saw of the tattooists at Nine Tails Tattoo, so went in for a consultation and ended up speaking with Chris Lambert (who is now based in Leeds), since he does a lot of script. This wasn't a traditional script though. We had to approach it more like a design since I wanted it in News Gothic MT, all capitals and italicised. I must've bored him. The rib is a strange place; if I'm standing normally, the tattoo is just over the size of my palm. If I raise my arms, it doubles in size-- and that's the size he had to tattoo. He had to do the outline of font in thin needle, then fill in using a thicker needle. Because of that, it took over two hours. It must've been tedious for him, but he was great about it. Would you get a visible tattoo or is it important to you that your tattoos are private and hidden? I would get a visible tattoo. I'm not personally against it, but I'm from Japan and at some point I'll have to move back there, even if only temporarily. Tattoos are heavily stigmatised in Japan. Getting tattooed is considered to be a very antisocial behaviour. I'm sure it's getting better, but you still technically can't go to public swimming pools, hot springs etc. It'd just be too much of a faff to have to cover my tattoos up. I don't think I'd get a very visible tattoo unless I was sure that I was rooted somewhere more accepting of tattoos. I'm still young and have a lot of moving around to do. I do love hidden tattoos though. This tattoo of mine is a very personal reminder. I think I got it in the perfect place.